You may be asking yourself, what is ombre? That's okay, I asked myself the same thing! According to what I have learned, it's shades of the same color. 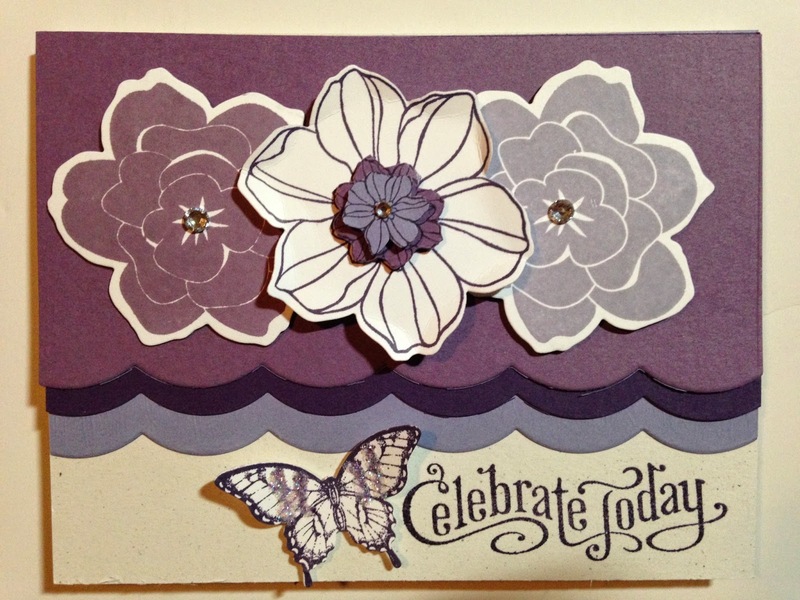 So, in the case of my card, I used shades of purple of course. Would you expect anything else? I used Elegant Eggplant, Wisteria Wonder and Perfect Plum. I have a lot to do and have conferences tonight, will be in Orlando all day Friday for meetings and then having dinner with friends from "home" (Michigan) in Orlando for dinner. And then... a quick class on Saturday. Oh yes, if you have been wanting to join us for a class but Sunday afternoons don't work, we are meeting this Saturday at 10am! Come make 5 projects for $15 or a minimum purchase! Email me if you'd like to join us! Love the flowers and the butterfly was a great touch! This is really pretty. Lots of dimension. The flowers are so pretty! I love your choice of colors! Love your purple scallop ombre! SO CUTE!! !